Social media has become a key marketing tool for businesses of all sizes who wish to increase their online presence. Some small businesses exist just on social media, using their Facebook account for example as their home page. It does have the advantage of making it simpler to keep your account up to date, and can be very effective for freelancers and sole traders. However, if you want to make a bigger impression online, you need to have both a website and social media accounts, and to get them both working harder for you, make sure they’re linked together. Adding social media buttons as part of a well-structured website is becoming standard practise now, but rather than just having a line of little icons linking through to your accounts, you could make more of a feature of them, for example, design a specific graphics box to feature the account you favour or that gets most used. If you have accounts you only use infrequently, either do more with them or drop them – don’t add them to your website because you think it makes a more impressive set of social media links, as when anyone clicks through they will be unimpressed to find little of any value behind the link. Make sure your buttons and descriptions are up to date with social media changes and new developments too, for example, you don’t want to be still referring to Facebook “fans”. 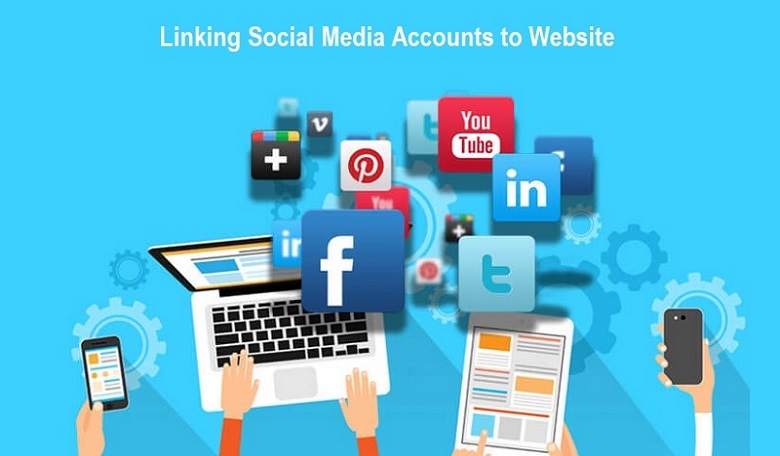 You can go a step further too and add an embedded social media link to your site. This will show up as an updated feed visible on your pages, displaying your latest tweets for example as you post them. If you do this, make sure you are updating regularly, as anything out of date will imply your site is not current and is less likely to find favor. Include “Like” and “Share” buttons so that anyone interested in your content can easily add it to their own social media sites. Make sure you understand the differences between all your buttons, for example, the link to your Facebook page and an instant “Like” link. When you’ve got all your social media links set up the way you want them, start running some analytics to find out whether they are being used and track how many times they are being used. Google analytics is a good place to start, and if you use social media management tools they will also have analytics. This information will help you to assess how well your buttons are working, so that you can change the position, design, or signposting to get more interaction. If you don’t study analytics you won’t be able to see how effective your strategy is, so it’s essential to keep track of the performance of your links. Adding the right social media links to your site in the optimum position and with the most effective signposting will add value to your website and contribute to your search engine rankings. It’s a simple task that will be worth the minimal time and effort it will take, so check your links today and make sure you’re taking advantage of this free marketing opportunity. Affiliate Marketing Guide for Beginners - How to Start & Choose the Best Program?